Discover how to build rustic furniture from cut timber in this comprehensive guide for woodworkers. Award-winning outdoor writer and photographer Alan Garbers shows how to use raw logs to make stylish eco-friendly pieces. Alan provides detailed, practical information on procuring and processing logs, with sage troubleshooting advice based on years of experience. Learn which species look best with the bark on, and which work better with the bark off. Find out why wood may shrink, warp, or crack, and how to deal with rot, decay, and insects. Get expert guidance on all the woodworking techniques you need to know, from steam bending and joinery to sanding, gluing, and finishing. 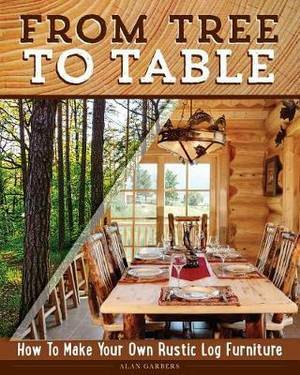 From Tree to Table offers instructions for making charming cabin-style beds, tables, benches, lamps, coat racks, kiva ladders, and more.